If the initial success of Pokémon Go has taught us anything it’s that for many of us, the real world is just a bit boring and that things can be rendered a lot more enjoyable with some adorable monsters layered on top of it. Thankfully, technology like augmented reality, iBeacons, interactive displays, the Internet of Things and more means that the world is not-so-slowly being turned into an interactive playground. All the better for our diminishing attention spans. LBB’s Laura Swinton explores how the concept of ‘fun’ is driving innovation. “Fun is essential, and if you think about it… the more fun people have in their life, the better off our world may be,” ponders Dave Meeker, a Vice President at agency Isobar and Head of Isobar’s NowLab, a global initiative that’s all about catalysing innovation. Most of the projects at Isobar’s NowLab are designed to solve a particular experiential or business problem via technology, but fun and enjoyment are also a key consideration that goes into product design. After all, if something’s no fun to use then… who would use it. One example is the prototype ‘magic mirror’ Dave and his team has created. It’s an interactive mirror that, essentially, makes the path from ‘try’ to ‘buy’ that bit more streamlined by allowing customers to log in and purchase in the changing room. But it’s playful too. “It brings a whole new level of whimsy and delight to the experience of trying on clothing and accessories,” he says. For the team at Biborg, an interactive agency with offices in Paris, London and Nantes, fun drives all of the experimental projects that comes out of its own Lab. “Fun is key in all experiences our Lab creates. We try not to set any limits and just let the creativity flow. Fun is also easy to engage with people as it triggers emotions,” says Kais Ali Benali, who heads up the agency’s London office. For the team at The Mill, which, as well as being a renowned VFX House also builds interactive installations, AR and VR projects, the concept of ‘play’ is one that they take very seriously. At The Mill, one particularly ‘fun’ example of Augmented Reality is their collaboration with fashion magazine Garage. In 2016 they built an AR app to turn cover models like Karli Kloss into Marvel-inspired characters. 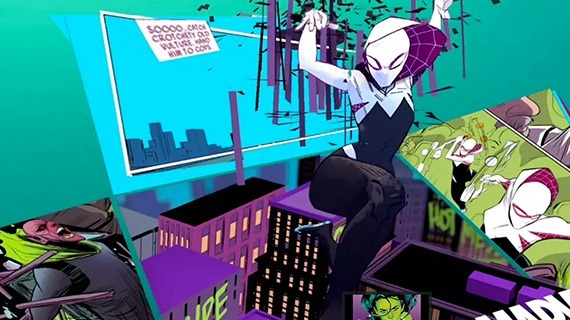 “When viewed through the newly relaunched GARAGE mobile app, the fierce heroines transform into 3D superheroes, bursting from magazine cover into a 360 augmented reality experience, controlled by the reader. "What could be more badass than that?” laughs Mill Creative Director Andreas Berner. As important as it is to be ‘fun’ perhaps it’s just as important to make sure that we avoid being ‘un-fun’, as Isobar’s Dave Meeker points out. Wonderfully clever digital experiences can be rendered frustrating if they’re glitchy or unintuitive. That feeling of seamless ease is influencing the kind of technology that Biborg is choosing to explore, smoothing the threshold between the real world and digital world. “One of our major challenges is to be able to quickly attract the attention of users and give them an urge to interact with an installation. That’s why we have been working with AR – and things like avatar control and face tracking – for some years now because the experience naturally becomes a digital extension of reality and is easy to access,” says Emilien Chiche, a Senior Creative Technologist at Biborg. For the team at The Mill, the concept of ‘fun’ doesn’t always have to be deployed in the most obvious way either. Their award-winning 6x9 VR project with The Guardian that explored the issue of solitary confinement was not designed to be enjoyable per se – but that didn’t stop it having an impact. “There will always be people who don’t enjoy wearing a headset and locking themselves into a virtual space,” says Jarrad Vladich, producer at The Mill. “But as with most things, if the experience is powerful, much like The Mill’s collaboration with the Guardian 6x9: A Virtual Experience of Solitary Confinement, then word will spread and people can’t help but be intrigued to explore the unknown. Good content contributes to people’s immersion, meaning even the most simple of experiences can spark enjoyment." While fun is an important driver, it’s also a pretty nebulous, constantly-shifting concept. Extremely new technology and means of interaction can make people unsure, and fun increases as they begin to get used to it. But as novel experiences become more everyday, they also become more mundane. Think of it like the adoption curve – I call it the ‘Fun Curve’. Adam Grint at The Mill notes that gestures we take for granted today were not ubiquitous even in the recent past. People are quickly adapting to new kinds of interfaces, which allows them to be more confident in how they play with these objects. “There is an evolution of the mind that takes place over time with any new interaction with technology. If you asked someone 10 years ago to do a pinch or swipe gesture on the phone they might think you had just been blasted in from outer-space,” he says. As people become more confident, they start to play more and their behaviours then feedback to help the makers enhance the fun factor even further still. But, eventually, what goes up must come down, completing the ‘Fun Curve’. “We've seen this with every new technology that eventually becomes ubiquitous... We end up taking it for granted and the grandest of things ultimately become commoditized,” says Dave. All of which simply reinforces what we all knew already – technological novelty in and of itself isn’t enough to sustain interest and that quality of experience and content is, ultimately king. We still read novels, after all. Is This Magical World Closer Than We Think? Tech watchers have been eagerly devouring news about upcoming mixed reality platforms like HoloLens and Magic Leap. While agencies and production houses are starting to get their hands on HoloLens, there’s still some uncertainty about how imminent this fully interactive playground really is. For Dave at Isobar, we’re living in a transition phase between ‘augmented reality’ – that is objects layed over the real world’ – into ‘mixed reality’ which is much more interactive. He is full of enthusiasm with the potential of Hololens – Isobar has been getting hands on with Hololens – though he admits that the current headset probably isn’t ready for mass adoption. Though he does foresee a future where VR, AR and MR converge into one piece of kit that’s easy for everyone. This is an interesting thing to discuss because we could all benefit from more fun in our lives. Now, when we talk about AR (as an example), we do run the risk of becoming over-stimulated and creating too much noise. We run into this when talking about proximity experiences (i.e. Beacons). If every retailer, restaurant and pub were to be broadcasting proximity marketing messages to your device, you'd suffer a relentless series of messages to your device. I can't think of anything less fun and more frustrating that that! For Dave Meeker at Isobar, there is a risk that brands could end up creating too much noise in this new digital environment – a playground in which normal people no longer want to play. iBeacons in every shop and pub and bus stop would set our phones off non-stop. He also refers to Japanese designer Keiichi Matsuda’s ‘Hyperreality’ film that shows an AR world gone mad.